What Can Landing Pages Be Used For? Are you launching a special event? Have a new business initiative that you want to roll out to your existing audience? Landing pages are a simple solution to your overall marketing strategy. Let us explore how a landing page can benefit your brand. First off, you may offer a variety of services or products and want to venture into a new territory. Landing pages can gauge interest and give you data into what your customers are paying attention to. A well-known clothing and art brand local to San Diego utilized a landing page to announce a new venture and generate buzz as they counted down to launch. It was easier and effective to create a landing page for the existing audience and gather email addresses from those who were interested. Also, their audience may not have been subscribed to the existing email list. This company was kind to share key metrics for their landing page. “With 413 page visits in a span of 5 days, we received 28 conversions. That’s a 6.7% success rate," the company's owner said. While these metrics apply to an organic promotion, the success rate is reflective of a well-established brand. They had generated buzz through the owner’s Facebook profile and their Instagram page. 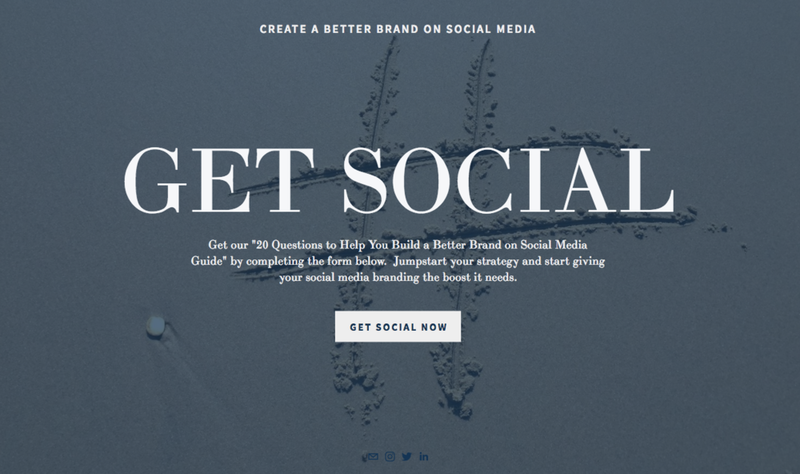 Landing Page Example from All The Social's website. Another thing to consider is that landing pages must be flexible. If they require a complete overhaul of your website, it becomes more of a pain to adjust them to reflect your marketing goals. Third party tools that allow you to create a landing page including tracking metrics and data storage is a solution to explore. Lastly, don’t overthink what you want on your landing page. Once a user has reached your landing page, it should be pretty clear what needs to be done. Whether it’s completing a form, downloading an app or buying a product from your website, do not overcomplicate it. If you make it easier for the customer, your conversions will reflect that. Don’t be afraid to go the landing page route, be clear and understand how to measure success.